Reference number for this case: 8-oct-54-Calais. Thank you for including this reference number in any correspondence with me regarding this case. Oct. 08, 1954, 09:15 P.M., Calais, (France). On the road to Boulogne a bluish object, clearly seen with a dome on top, dived toward the ground, became white and went away. (L'Aurore, Le Figaro, le Parisien, 11 oct 1954) (44, 45; M 154). The author indicates that on October 8, 1954, on the road of Boulogne, close to Calais, a bluish object, with a dome, was clearly seen; it dove towards the ground. It then went away, becoming white. The following morning, several inhabitants of Calais saw a shining object which did not land. The two authors indicate that in Calais in the Pas-de-Calais, on October 8, 1954 at 09:15 p.m., on the left of the road of Boulogne, the witness sees a gleam coming from the fields and resembling that of the lighting of a bicycle. The gleam, suddenly, spade towards the road in the direction of the motorist and a machine of very great dimension appears. It is of bluish color, like the headlights painted in blue of the cars during the war. The witness stops short and turns his headlights off. The machine passes above the road, veers and slips by for Calais. At the time of its disappearance, the initial bluish gleam changed to a white headlight such as it appeared in the beginning of the sighting. The authors indicate that the sources areL'Aurore, Le Figaro, Le Parisien, La Montagne, 11 octobre 1954; and the Vallée catalogue. A domed object, bluish in color, swooped over a road, turned a white hue, and then sped away. 83. 83. Paris, France. 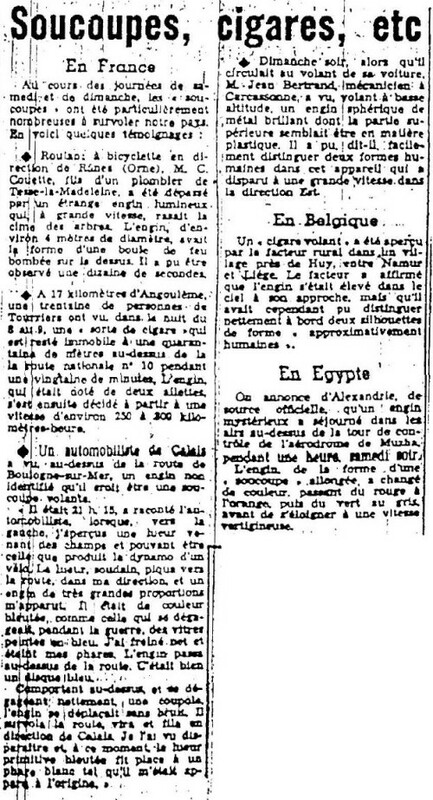 Le Parisien, 11 October 54. The Belgian ufologist indicates in her chronology that in 1954, on October 8, in France, in Calais, at 21:15 on the road of Boulogne, a bluish object carrying a quite visible dome at the top, doved towards the ground, took a white color and disappeared. The sources are indicated to be "L'Aurore, Le Figaro, le Parisien, 11 Oct 1954" and "Jacques Vallée: 'Chronique des apparitions ET' - DENOEL 1972 - J'AI LU COLL. - p. 272." On the road to Boulogne a bluish object, clearly seen with a dome on top, dived toward the ground, became white and went away. Jerome Beau indicates that on Friday October 8, 1954, at 21:15 in Calais in France, on the road of Boulogne, a bluish object, bearing a quite visible dome at the top, plunges towards the ground, takes a white color and disappears. Jérôme Beau indicates that the sources are L'Aurore, Le Figaro, the Parisien, October 11, 1954. This ufologist indicates that on October 8, 1954, in Calais, in the Pas-de-Calais, "Towards 21 15, the witness, a motorist, sees on the left of the road of Boulogne, a gleam coming from the fields and looking like that which a bicycle's lighting produces. The gleam suddenly, dives towards the road in the direction of the motorist and a machine of very great dimension appears bearing at the top a quite visible dome and moving without noise at low altitude. It is of bluish color, like the headlights painted in blue of the cars during the war. The witness slows down short and extinguishes his headlights. The machine passes above the road, veers and fliesto Calais; at the time of its disappearance, the initial bluish gleam changes to a headlight such as it appeared in the beginning." Il indique comme source: "livre 'Rencontres rapprochées' de M. Figuet page 134". Luc Chastan indicates that in the Pas-de-Calais in Calais on October 8, 1954 at 21:15 hours, on the left of the road of Boulogne, the witness sees a gleam coming from the fields that could have been the light that a bicycle produces. The gleam, suddenly, goes towards the road in the direction of the motorist and a machine of very large size appears. It is of bluish color, like the headlights painted in blue of the cars during the war. The witness stops short and turns off his headlights. The craft passes above the road, veers and passes by for Calais. At the time of its disappearance, the initial bluish gleam is replaced with a white headlight such as it appeared in the beginning. The website indicates that on 8 October 1954 at 21:15 in Calais, France, an "object was observed. It buzzed a witness. One blue disc was observed by one witness on a highway for over three minutes." The sources are indicated as Vallee, Jacques, Computerized Catalog (N = 3073); Vallee, Jacques, A Century of Landings (N = 923), (in JVallee04), Chicago, 1969; Schoenherr, Luis, Computerized Catalog (N = 3173); Hatch, Larry, *U* computer database, Author, Redwood City, 2002. *Oct. 8, 1954 - At 9:15 p.m., on the road to Boulogne in Pas de Calais department, France a bluish domed disc-shaped object dove toward the ground, became white and then flew away. (Source: Aime Michel, Flying Saucers and the Straight Line Mystery, p. 154; Jacques Vallee, Passport to Magonia: A Century of Landings, case # 212). [---] Article in the national newspaper L'Aurore, Paris, France, October 11, 1954. [---] Article in the national newspaper Le Parisien, Paris, France, October 11, 1954. [---] Article in the regional newspaper La Montagne, Clermont-Ferrand, France, October 11, 1954. [lg1] "The Fifth Horseman of the Apocalypse - UFOs: A History - 1954 October", monography by Loren E. Gross, USA, page 22, 1991. 1.0 Patrick Gross January 26, 2009 Conversion from HTML to XHTML Strict. First formal version. Additions [go1], [jb1], [lc1], [ud1]. 1.1 Patrick Gross September 24, 2014 Additions [cr1], [ni1]. 1.2 Patrick Gross November 20, 2016 Additions [er1], [ub1]. 1.3 Patrick Gross December 19, 2016 Additions [lg1]. This page was last updated on December 19, 2016.